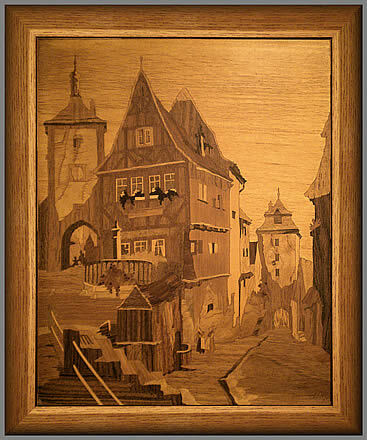 October, brings us more exquisite examples of the detailed marquetry work produced by the infamous Buchschmid and Gretaux wood inlay company. The not too often seen Witches Quarters is on display this month. It is a lovely picture, which, despite its title, is a very picturesque scene and is full of charm and 'friendly' magic! The true story of an encounter with Mr Buchschmid during World War 2 is an enthralling read we are sure you will enjoy. 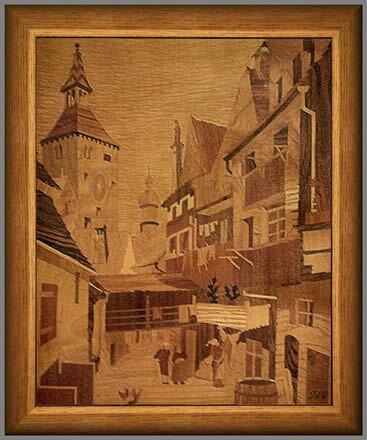 October's updates add more examples of the Buchschmid and Gretaux legendary marquetry output to our pages. 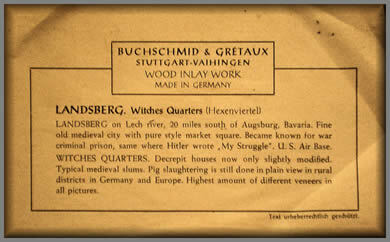 The first picture you see on our October's page is the superb Witches Quarters from the Buchschmid and Gretaux catalogue. 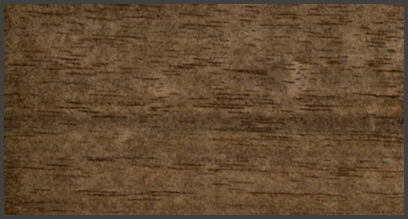 The veneer selection works really well in this picture. 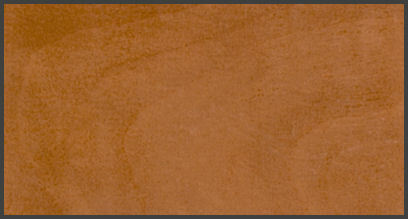 The Rosewood used for some of the shadow area is particularly effective. The veneer used for the sky looks very much like Aspen to our eyes. If you can find a good piece of Aspen with appropriate grain figuring, it can indeed be used to produce a very pleasing sky effect. 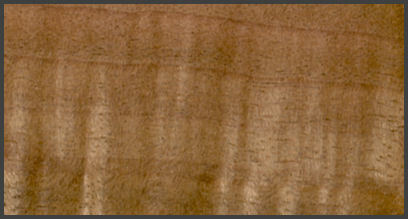 Buchschmid and Gretaux state that this picture contains the largest selection of veneers of any of the pictures in its large catalogue. 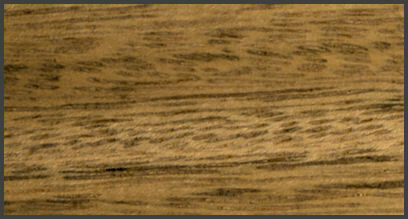 The picture obviously does contain quite a few veneers, so let's see if we can name most of them for you. The sky, as we've already said is Aspen. The shadows on the stairs and main fence are Rosewood. The frontage of the main house facing us looks very much like a combination of Walnuts, possibly European and Australian. 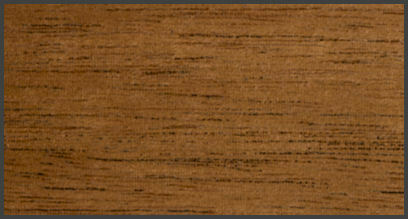 The street surfaces could well be Cherry for the lighter parts and Honduras Mahogany for the darker areas. The remaining walls of the buildings and houses are most likely made from a combination of; Pear for smoother and slightly darker walls of the main house - Afara with the grain placed horizontally for the walls of the two 'tower' looking buildings. The roofs of those two buildings may be Lime and Eucalyptus, also placed horizontally. 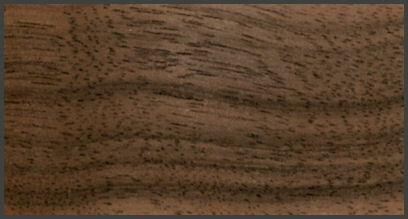 The darker shadows are probably more Walnut. 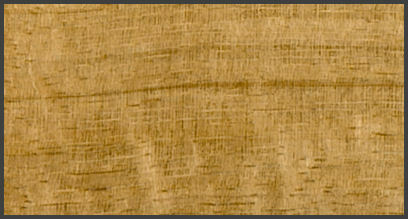 There are obviously several more veneers used for smaller parts of the picture, but the twelve listed and displayed above constitute the major part of the picture's make up. 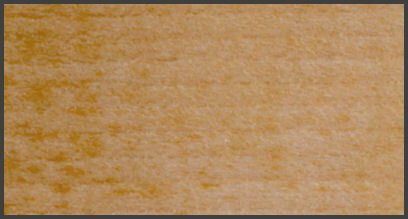 Slight tonal differences may be discerned between our examples and the ones seen in the picture, but the grain pattern and figuring of the various veneers helps very much to identify the veneers in those situations. 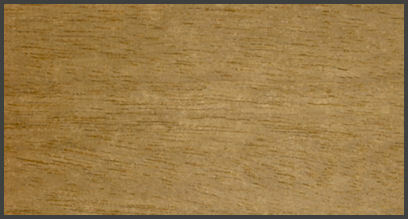 As previously explained in these pages, climatic conditions (along with age) often causes colour changes to a degree with many veneers, so therefore some allowance should be made for these quite natural differences. 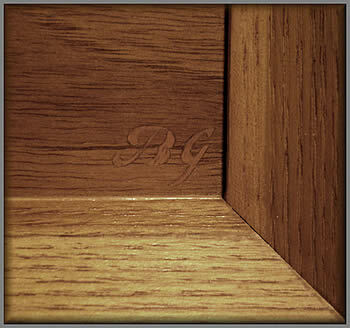 We would like to offer our thanks to Kathy Hardeman for her generous help in providing valuable information concerning technical aspects of the two featured B & G wood inlay pictures displayed on this page. We recently had a wonderful story sent in to us concerning the infamous Mr Buchschmid and an apprehensive and understandably nervous personal experience he encountered during a particularly calamitous period of the Second World War. 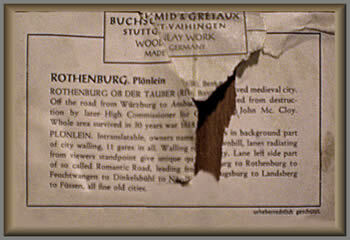 At the time this incident occurred there must have, not unsurprisingly, been a very heavy bombing raid on the town of Stuttgart (the Buchschmid and Gretaux location in Germany) when Mrs “O” (the heroine of this story) happened to chance upon Mr Buchschmid and found him in a most nervous and distraught condition. It appears that the heavy bombing had literally buried and interred his valuable wood and veneer stocks under tons of rubble and war damage. Obviously Mr Buchschmid had no means of knowing the fate of his stock and was now faced with the unfortunate prospect of his livelihood going in that same sad direction as may well have befell his cherished wood and veneer stock. Being the most generous soul that she was, our wonderful Mrs “O” offered to help with the difficult task of recovering what was left of the prized Buchschmid and Gretaux wood and veneers stock. They nonetheless set to with a will and together they dug down into the rubble and detritus and eventually managed to salvage as much as they could from the devastation. The effort involved made it a very heavy task, but they persevered with their hard work and recovered a goodly amount of the wood and veneer stock. They must have been particularly successful because Mrs “O” and Mr Buchschmid became the dearest of friends – and to show his appreciation of her kindness, Mr Buchschmid made three beautiful tables for Mrs “O”. The tables have been described by Valerie (our most admirable contributor who sent in this wonderful story) as “the most beautiful pieces of work in the world”. If they are truly as good, or better, than the normal run of the Buchschmid and Gretaux works, then they must be really good indeed. Valerie has offered to send us some photos of the tables. If they arrive before our next update we will try to bring them to you with our November posting, but, other than that we will display them as and when we get them. We are certainly looking forward to seeing them. Click the above button to return to page 12 of "Can You Help"
Click the above button to visit page 14 of "Can You Help"